What is the Sussex Armed Forces Network? The Sussex Armed Forces Network (SAFN) is a multi-organisational group which includes members from the NHS, MoD, Armed Forces Reservists, Mental and Physical Health Clinicians, the Royal British Legion, SSAFA and other interested charities and organisations from across Sussex (i.e. police and local authorities). The members work together to improve the lives of the armed forces community (ex and serving personnel and their immediate families). The network also includes champions from a wide range of the organisations across Sussex who are advocates for the armed forces community and have the skills and knowledge to support through direct service provision, linking with other organisations or signposting to where additional support could be received. It is managed by the Armed Forces Director for both Sussex and Kent & Medway CCGs. It has a Clinical Director from the Sussex Partnership NHS Foundation Trust as the Chair of the Network. Its aim is to facilitate our CCGs and the local community in the delivery of the Armed Forces Covenant Commitment. In November 2014, the Network won a National Military and Civilian Health Partnership Award for its work on education, training and research with local military personnel. The Network was commended for its work on developing a unique set of relationships to ensure organisations are identifying and meeting the specific needs of the Armed Forces community through local health and care services. Dr Nick Lake is a Senior Clinical Director at Sussex Partnership NHS Foundation NHS Trust. As a Consultant Clinical Psychologist, Nick has a specialist clinical interest in working with people who are suffering from the effects of trauma, particularly veterans. He is also a Champion for veterans within the Sussex Partnership NHS Foundation Trust. Andrew Layzell has 45 years military experience after joining the Army in 1971 at the age of 15, he joined the Infantry junior leaders Battalion in Oswestry Shropshire’ Joining his operational Battalion 1st Battalion the Queens Regiment in 1973. As a career infantry man, having worked through the ranks, he completed 24 years as a regular soldier having undertaking 8 operational tours that included one of 2 year, served as an instructor at the Royal military Academy Sandhurst and Regimental Sergeant Major of an Infantry Battalion. Since leaving the Regular Army in 1996 he was commissioned into the TA, serving as Transport Officer, and Machine Gun Platoon Commander. In 1988 he took up the appointment of Permanent Staff Administration Officer for B Company 3rd Battalion Princess of Wales’s Royal Regiment, in this roll he was responsible for all aspects of recruiting, training, administration, welfare, deployment and recovery of all combat reservists in Sussex, and Casualty Officer for Sussex. Andy was awarded the MBE in the Queens 2014 New Year’s Honours list. The Area Office and Sussex welfare team can be found at 100 Queens Road, Brighton (Mon-Fri 10:00-16:00) or can be contacted via the Contact Centre on 0808 802 8080 seven days a week. SSAFA the Armed Forces charity, is the oldest military charity and was established in 1885. 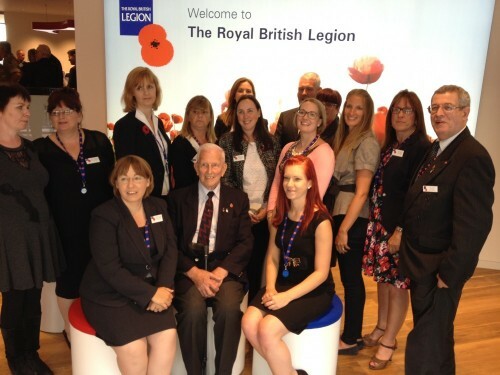 SSAFA provides lifelong support for those who are serving or who have ever served in the British Army, the Royal Navy, the Royal Marines or the Royal Air Force, and their families. Eligibility is based on ‘one day of paid service’ and help is provided whenever there is hardship, loneliness or need. SSAFA works closely with the other Service charities and also occupational and generic charities. Practical and financial assistance is provided in varied ways: it may be helping to pay a war widow’s heating bill, dealing with housing and care problems, providing debt guidance, friendship, helping a family with a disabled child, funeral costs, arranging the provision of essential disability equipment or providing financial assistance for the purchase of clothing or household goods. 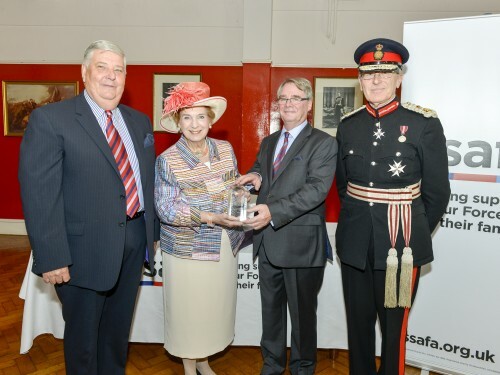 The SSAFA Sussex Branch is run by over 60 unpaid volunteers and was awarded the prestigious Queens Award for Voluntary Service in July 2015 (pictured). The community as a whole is better facilitated to provide excellent support to the Armed Forces Community across Sussex. Those who serve in the Armed Forces whether Regular or Reserve, those who have served in the past and their families, should face no disadvantage and receive the integrated care and support they require tailored to their particular needs in accordance with the Armed Forces Covenant. To support individual vulnerable and complex members of the Armed Forces Community. To support faster appropriate care for the Armed Forces Community whether reservists/regulars to be deployable or those who have been impacted by serving or a member of their family. Holistic support for individuals, families and carers to ensure wellbeing, prevention and care. To support the quality and safety of the armed forces community. To support the transition and utilisation of this community as an asset to the wider population.